Call us Goldilocks. Call us sluts. Whatever you call us, one thing is true: We’ve slept in a lot of different beds this past year. Blame it on our uncompromising need to see the world. Just like the beds for Goldilocks—and the lovers for bed-hoppers—some hotels rocked our world, while others … well … we’re pretending those nights never happened. As you plan your journeys for 2016 and beyond, read through our list of 2015’s best hotels to find one that’s just right for you. While Cape Town overflows with youth, recklessness and blurred lines, the Belmond Mount Nelson Hotel offers a sophisticated and old-fashioned experience, without sacrificing style. You’ll never forget where you are, though, thanks to Table Mountain, which makes its way into the view from pretty much anywhere on the property. Throw in the local artists on display and the overall multicultural feel, and you’ve got one of the best hotels of 2015. As you walk through jungle to your private straw-roofed hut while swatting swinging vines away from your face, the first thought that comes to mind is, “what did I do to deserve this?” For as low as $80 a night, you get a private bungalow that seems to be dangling amongst tree branches, an outdoor shower, and three private beaches. What’s not to love? If you’re looking for a down-to-earth, low-key stay in an upscale high-energy area, you’ll feel right at home at these boutique accommodations. At the Cadet Hotel, the focus is on unique detail complimented by gourmet meals instead of larger than life cocktails and DJ-spun pool parties. What won us over was that the owner of the property picks up tchotchkes on her travels and perfectly places them throughout the hotel, making it feel like the disheveled home of an artist. Oh, and the fact that Clark Gable once stayed here. Where else can you spot a giraffe on the way from the airport to the lodge? I can honestly say I’ve never been happier than I was while staying at this lodge, and it wasn’t just because I saw leopards, lions, elephants and buffalo roaming freely up close. 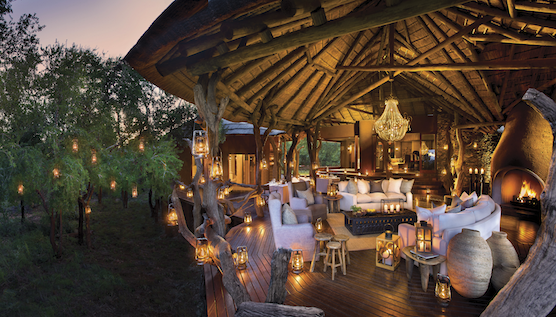 A stay at Madikwe Safari Lodge is complimented by delicious meals over carefree conversation learning about life in the bush, and nights under strung lights listening to animals in the distance. The view from your room is so breathtaking, it seems that when designing the hotel, they used the rooms to perfectly frame a picture of the bush. Madikwe Safari Lodge will bring tears to your eyes, no matter how tough you are. Conceived by local hip-hop DJ, DJ Bijal, Hotel BPM is a minimalist-style 75-room hotel. Each month the hotel features a playlist of tunes curated by DJ Bijal that streams throughout the property and includes artists like Jay Z and Baauer. For those aspiring DJs, the property is known to team up with local Scratch DJ Academy to offer free DJ lessons, and that’s why it’s one of our favorites. 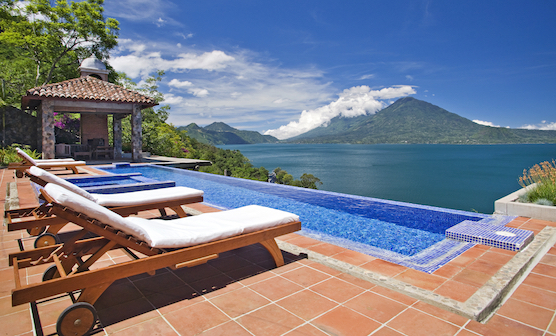 This Guatemalan inn makes our list because there is someone to serve you around every corner due to the property’s small size and copious staff, no one to disturb you due to the abundance of hiding-spot worthy nooks and crannies and always a jaw-dropping view due to its location perched high above Lake Atitlan surrounded by volcanoes. Casa Palopo on is a mystical accommodation that will sweep you away with the waves of the lake. We never wanted to leave. If you took a chic and modern New York City penthouse and shoved it into a dingy old Hampton’s motel, you’d have Baron’s Cove, the Sag Harbor staple that reopened in 2014 after a two-year renovation. Basically, Baron’s Cove makes motels look good. The best part about this hotel is that while it has been completely stripped and renovated, it still exudes the personality of a quaint local inn, it just looks better while doing so now. We can’t resist a hotel with this much outdoor space per room and a dark English-style drawing room of a bar. Book a room at the Pantone Hotel in Brussels, Belgium, and you can vacation away from the visual clutter of your regular life. Architect Olivier Hannaert and interior designer Michel Penneman have made sure the digs feature colors harmoniously. The hotel utilizes seven color palettes spread across 59 rooms, and all of the shades are properly numbered and labeled. The whole business seems awfully OCD, but after taking in to account our messy everyday lives, one can’t deny the appeal of staying someplace where there’s color for everything, and every color is in its place. Housed in a series of converted tobacco and bourbon warehouses, this art museum and boutique hotel features 91 rooms and an award-winning restaurant. Kentucky’s 21c Museum Hotel is occupied by a rookery of resident red penguin sculptures and an assortment of artfully designed rooms that either include original art or are works of art themselves, like this Asleep in the Cyclone room featuring a sculptural installation by Jonah Freeman and Justin Lowe. This hotel’s Lapland location gives you the chance to witness the Northern Lights without having to venture out into the cold. 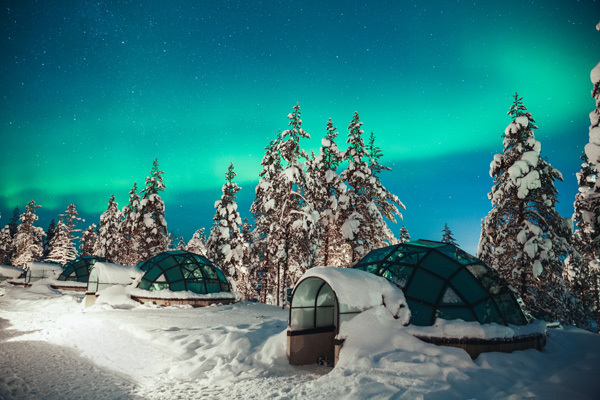 Any place where you can view the illuminated phenomenon from the comfort of your very own igloo is a winner in our book. You might recognize these tree houses or their designer from Animal Planet’s Treehouse Masters. Long before Pete Nelson got that gig, he opened TreeHouse Point. Tucked away in the trees of the Pacific Northwest, the six serene houses at this family-run bed-and-breakfast resemble the backyard version many of us dreamed of as children. 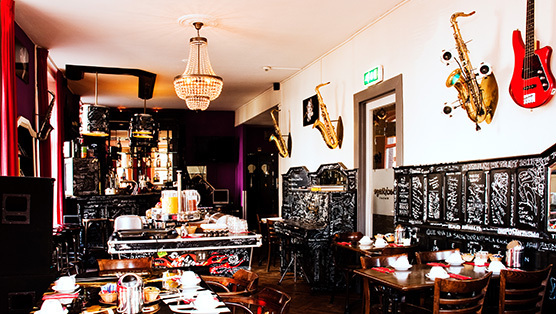 Designed to accommodate touring musicians, the Backstage Hotel features both private and shared rooms decorated with musical accents like saxophones and guitars hanging on the walls. Backstage hosts open mic nights on Tuesdays with the help of the Amsterdam Songwriters Guild. The winning factor? Although management remains tight lipped about bands that have stayed there, stealthy guests might find rockers’ signatures scribbled onto the bar’s piano. 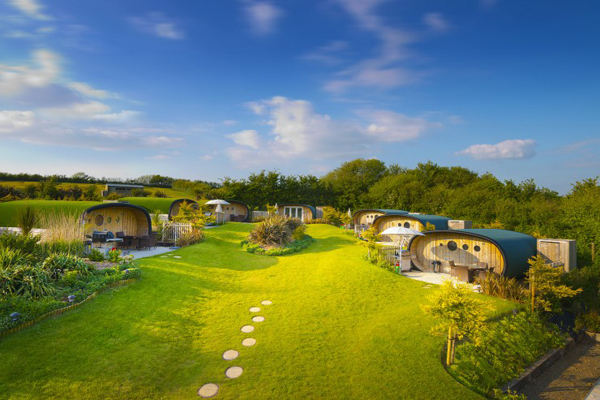 These eco-pods just off the North Cornish coast offer a surfer’s respite sans all the sand. Located on 26 acres of quiet farmland, the Atlantic Surf Pods are a big step up from pitching a tent on the beach. With their heated floors and showers, king-size beds and giant beanbag chairs, a night in one of these pods provides all the joys of camping (fresh air, nature and a chance to get away from it all) without sacrificing comfort. We love a hotel with beaches a mile away, but not as much as we love a surprise; surfing in the U.K.?! Wes Anderson’s lips are sealed but rumor has it the Corinthia Hotel Budapest, which opened in 1986, is actually his film’s main inspiration. The resemblance is uncanny and the hotel promotes itself as the Grand Budapest. We’re sold. Every now and then we need to feel like the Queen, and Dromoland fulfills that need. Featuring lavish interior design, delicious food and the warmest of welcomes, this ornate castle gives its guests access to flourishing gardens and one of the best golf courses in the area. The best part? You can stay in a castle for as little as $230 a night. No royal lineage needed. This property reigns as the best (and only) five-star resort in this particularly stunning—and small—South African mountain nation. Not only does a visit come with a phenomenal view of the mountainside, but also guests help the lodge give back to the local community. The luxury hotel uses rainwater and provides clean drinking (and bathing) water for preschool students and the community’s fruit trees—as well as for its own use. Bonus points for sustainability. We’re not usually fans of chain hotels as they can be boxy and monotone, but this one breaks the mold, which isn’t easy. The Hilton Anatole in Dallas is home to the largest hotel collection of art and antiques in the country. Walk the art-filled halls and lobby of this hotel and you’ll feel more like you’ve managed to book an overnight at the Dallas Museum of Art than a Hilton. They even have a piece of the Berlin Wall, so you can say you’ve been to the historic site even if you’ve never been to Germany. Can’t beat a place that lets you kill two birds with one stone. To get a true feel of San Francisco’s art scene, you don’t have to leave your hotel, that is, if you’re staying at Hotel Des Arts. The boutique hotel features the work of emerging artists from around the world all over the walls. Each of the 51 rooms, as well as the hallways, display “edgy graffiti-inspired works of art.” While we love exploring San Fran, we can’t resist a stay in a hotel where culture abounds. A hotel that Hemingway, Steinbeck and Fitzgerald spent time in?! Done. In the past, this building had been an artist’s space and was the longtime home of Thomas Mann. The new hotel’s design pays homage to its artistic and literary history in a number of ways. Plus, every piece in every room—from the artwork to the furniture to the bath products—is custom made for the hotel by New York artists and craftspeople. Oh and by the way, it’s all for sale. That sculpture? You can buy it; they’ll just commission the artist to create a new one. We’re big fans of a hotel that boosts business for local artists. Undoubtedly the coolest hostel in Prishtina, The White Tree is also a hangout spot for the city’s creative types because of the cozy outdoor space and nightclub in the back. The décor is bold and colorful, the owner is welcoming, and the people are friendly. Beds cost 9-12 euros and a private room is 15 euros per person. Those things combined make it our favorite hostel of 2015.